Each year happens the same, the weather gets warmer and before we know it, we are barraged by this festival of blooms called springtime. It seems there is barely enough time to enjoy one flower display before the next one is vying for our attention, screaming out our name to be looked at and admired. We can appreciate these heightened, but brief flowering shows of trees and shrubs for what it is, thinking the moment to shine has passed once the petals have fallen to the ground. Or, we can see this as the moment you can push the boundaries of bloom time, prolonging the display by taking advantage of tiny counterparts that might sometimes go unnoticed by being so low to the ground. Underplant these areas with small plants that bloom during the same period. To really catch the attention of a wandering eye, pick colors that are bold together, we can save subtlety for another time. 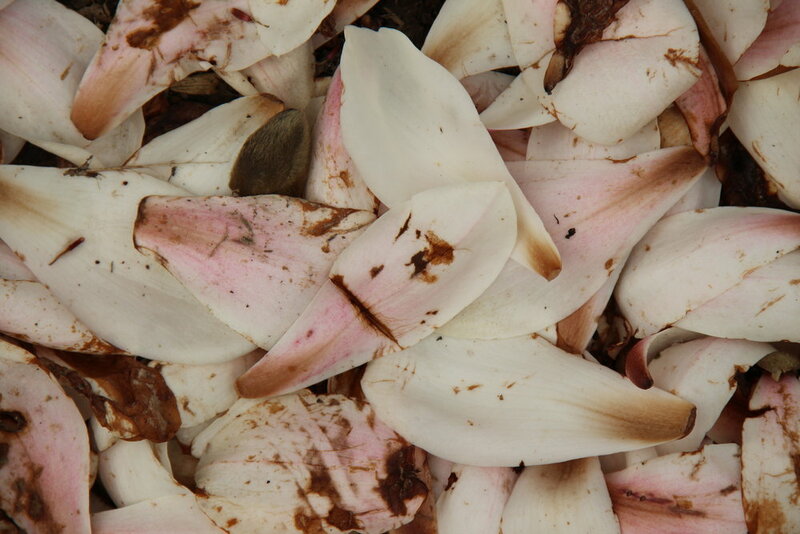 The goblet shaped flowers of Magnolia x soulangeana rains down fleshy white petals flushed with pale pink onto the reddish-purple blooms of the small Primula pulverulenta, causing the blooms of this small perennial with gray stems to hover above a pale creamy background. In another scenario we have a study on complementary colors, where the diminutive blue blooms of Myosotis sylvatica are held even higher against a carpet of orange flowers belonging to the evergreen shrub Berberis darwinii.